Barcelona Home voetbalshirt 2005 - 2006. Longsleeve version of the iconic Barcelona kit of 2005, the same long sleeve that Ronaldinho dazzled against Los Blancos at the Bernabeu and applauded by Madristas. they won the La Liga twice against 2nd place Real Madrid. and won the Champions League for the second time against Arsenal 2-1 at Paris. Nike Junior Barcelona Replica Shirt with Ronaldinho & number 10 on back. Home shirt of FC Barcelona, 2005-06. Player #19 MESSI. Relive Andres Iniesta’s 2005/2006 La Liga season with this Vintage Adidas Barcelona home football shirt. 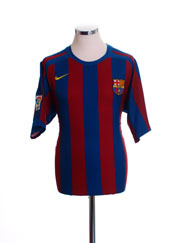 2003-04 Barcelona Home Shirt Nike Original Vintage shirt from Classic Football Shirts Ltd.